- Light of Salvation, Logic of Destruction is the 6th V Series Extra Booster released in the Japanese and English format. - Includes support for the clan: Royal Paladin, Kagero, Nova Grappler and Link Joker. - Includes further boosts to the archetype for the Platinum Standard format: Blaster, Beast Deity and Raizer. - Introducing new attributes to Link Joker clan: Starhulk (星骸者). h carton includes 24 displays. - Each pack includes 7 cards, two of them being R or greater. - Includes boosts to Imaginary Gift: Force (Royal Paladin, Kagero & Link Joker) and Accel (Nova Grappler). CONT [V]: During your turn, if you have six units with "Blaster" in their different card names, this unit gets the original [Power] and [Critical] of all of your rear-guards. AUTO [V]: When your drive check reveals a card with "Blaster" in its card name, you may call that card to an open [R]. CONT [R]: If you have six types of units with "Blaster" in their card names, they cannot be chosen by your opponent's effects. AUTO [R]: When placed, if you have three or more types of units with "Blaster" in their card names, COST[discard a card from your hand], search your deck for up to one "Arc Saver Dragon", reveal it, put it into your hand, and shuffle your deck. CONT [V]: If you have four or more rear-guards, this unit gets [Critical] +1. AUTO [V/R]: When placed, COST[C-Blast (1) & S-Blast (1)], choose one of your opponent's rear-guards in the front row, and retire it. CONT [R]: If you have six units with "Blaster" in their different card names, this unit gets [Power] +15000. AUTO [R]: When it attacks a vanguard, if you have a vanguard with "Blaster" or "Arc Saver" in its card name, look at the top of your deck, and put it on the top or bottom of your deck. 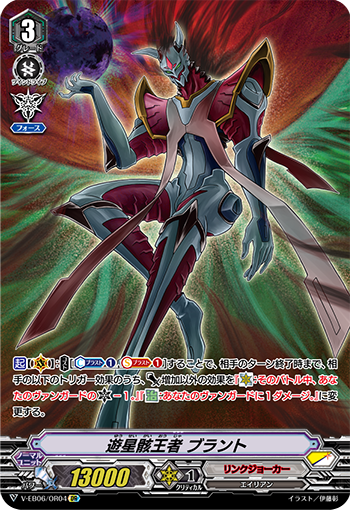 CONT [R]: During the battle that it boosted, if you have a vanguard with "Blaster" or "Arc Saver" in their card names, this unit gets [Power] +2000. AUTO [R]: When it boosts, if you have six units with "Blaster" in their different card names, choose a rear-guards in your opponent’s front row, and bind it. CONT [R]: If you have six units with "Blaster" in their different card names, they get "Boost". AUTO [R]: When your vanguard's attack with "Blaster" or "Arc Saver" in its card name hits a vanguard, you may return this unit to your hand. AUTO [V]: When placed, call up to one "Dragonic Neoflame" in your drop zone to [R]. 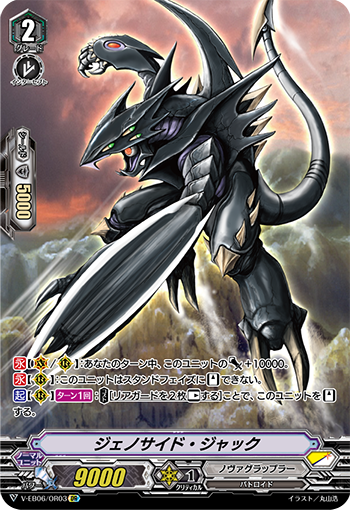 AUTO [V] [1/Turn]: At the end of the battle it attacked, if a grade 3 is in your soul, COST[C-Blast (1) & discard two cards from your hand], [Stand] this unit and one of your "Dragonic Neoflame", and they gets drive - 1 until the end of the turn. AUTO [V]: When placed, COST[C-Blast (1)], draw one card, call a card from your hand to [R], and attack your opponent's vanguard with that unit. If that attack did not hit, at the end of that battle, [Stand] that unit. AUTO [V]: When it attacks, COST[C-Blast (1)], and [Stand] one of your rear-guards. ACT [V]: COST[C-Blast (1)], until the end of your opponent's turn, change the below effects for your opponent's trigger effects other than the [Power] increase to "CRITICAL: Your vanguard gets [Critical] -1 until end of that battle. ", "HEAL: Deal one damage to your vanguard. ", "DRAW: Discard a card from your hand. ", and change the [Power] increase for FRONT trigger to the back row. CONT [V/Hand]: If you have a total of three or more types of cards with "Blaster" in their card names on your [V] and drop zone, this card gets grade -1. AUTO [V]: When placed, COST[C-Blast (3) & S-Blast (3)], search for up to one card with "Blaster" in its card name each from your deck, drop zone, soul, and damage zone, to a total of three or less cards, call them to [R], and shuffle your deck. CONT [V/R]: If your opponent has no rear-guards, his unit gets [Power] +3000. AUTO [V/R]: When placed, COST[S-Blast (2)], choose one of your opponent's rear-guards, retire it, look at seven cards from the top of your deck, reveal up to one card with "Overlord" in its card name from among them, put it into your hand, and shuffle your deck. AUTO [V]: When its attack hits, draw a card. AUTO [R]: When your opponent's rear-guard is retired during your turn, COST[retire this unit], and draw a card. AUTO [R]: When placed, if you have a total of four or less cards in your hand and rear-guards, draw a card. AUTO [R]: When you [C-Blast], COST[retire this unit], and [C-Charge (1)]. ACT [V]: COST[C-Blast (1) & S-Blast (1)], until the end of your opponent's turn, the effects other than [Power] increase from your opponent's trigger effects change to "CRITICAL: Choose all of your vanguards, and it gets [Critical] -1 until end of that battle." and "HEAL: Deal one damage to your vanguard.". 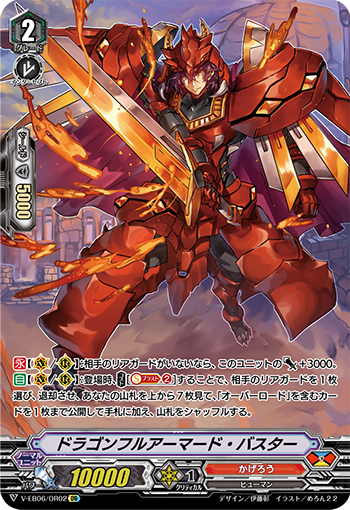 AUTO [R]: At the end of the battle that it attacked a vanguard, if your opponent did not call trigger units during that battle, COST[C-Blast (1)], you draw a card, choose one of your opponent's grade 2 or greater rear-guards, and bind it face down. CONT [R]: If you have six units with "Blaster" in their different card names, they cannot be chosen by your opponent's effects. AUTO [R]: When your "Dragonic Overlord the Great" attacks, until end of that battle, that unit gets [Power] +5000, then, COST[C-Blast (1)], and that unit gets [Critical] +1. AUTO [V]: When it attacks, COST[C-Blast (1)], and [Stand] all of your rear-guards on your additional [R]. CONT [V/R]: During your turn, this unit gets [Power] +10000. CONT [R]: This unit cannot [Stand] during stand phase. ACT [R] [1/Turn]: COST[[Rest] two rear-guards], and [Stand] this unit. AUTO [R]: When your drive check reveals a card with "Starhulk" in its card name, this unit gets [Power] +10000 until end of turn. AUTO: When it intercepts, if you have a vanguard with "Starhulk" in its card name, look at the top card of your opponent's deck. You may bind that card. AUTO [V/R]: When placed, COST[C-Blast (1)], choose a column, call up to two cards from your hand to [R] in that column, and until end of turn, this unit gets [Power] +5000. If you called two, draw a card. CONT [R/G]: All of your "Undulatory Sage, Tarna" on [R] or [G] get [Power] +5000 / [Shield] +5000. CONT [R/G]: All of your "Rotary Sage, Belk" on [R] or [G] get [Power] +5000 / [Shield] +5000. AUTO [V/R]: When placed, COST[C-Blast (1) & S-Blast (1)], put the top card of your deck into your drop zone, choose the same number of your opponent's rear-guards as the grade of that card, retire them, and if you did not retire even one unit, this unit gets [Critical] +1 until end of turn. 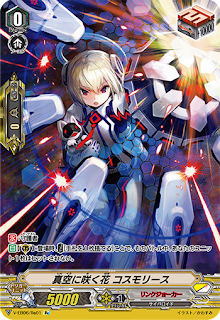 ACT [R] [1/Turn]: COST[C-Blast (1) & put a grade 2 or greater card from your drop zone on the bottom of your deck], choose one of your opponent's rear-guards, and retire it. AUTO: When this [Rest] unit is retired from [R], return a <Hero> from your drop zone to your hand. This ability may only be used by a card with the same card name once a turn. ACT [R] [1/Turn]: COST[C-Blast (1) & S-Blast (1)], [Stand] this unit, and attack your opponent’s vanguard with it. If the attack did not hit, at the end of that battle, [Stand] this unit. AUTO [R]: When placed during your main phase, COST[S-Blast (1)], [Stand] all of your units. If you [Stand] two or more units, and if "Beast Deity, White Tiger" is in your soul, draw a card. CONT [R]: This unit gets [Power] +10000, and your opponent's vanguard gets drive +1. AUTO [R] [1/Turn]: When a trigger unit is placed on your opponent's [G] for the battle your other unit attacked, COST[S-Blast (1)], and this unit gets [Power] +10000 until end of turn. AUTO [R]: When placed, COST[C-Blast (1)], reveal four cards from the top of your deck, put up to one grade 2 or greater card with "Starhulk" in its card name from among them into your hand, and put the rest into your drop zone. AUTO [G]: When an attack does not hit, COST[C-Blast (1)], and move this unit to a [R] without a unit. ACT [R]: COST[S-Blast (1) - "Starhulk, Lurli"], and look at the top card of your opponent's deck. You may bind that card face down. AUTO [R]: When placed, if you have five rear-guards, COST[S-Blast (2)], and draw a card. AUTO [R]: When your other <Flame Dragon> is placed on [V] or [R], this unit gets [Power] +5000 until end of turn. AUTO [R]: When placed, if your opponent has three or less rear-guards, all of your units in the same column as this unit get [Power] +3000 until end of turn. ACT [R]: COST[C-Blast (1) & retire this unit], choose three of your opponent's rear-guards, and retire all of your opponent's rear-guards other than those units. ACT [R]: COST[S-Blast (1) & retire this unit], and one of your vanguards gets [Power] +15000 until end of turn. AUTO [V/R]: When it attacks, one of your other units gets [Power] +3000 until end of turn. If that unit is [Rest], it gets +5000 instead of +3000. AUTO [R]: At the end of the battle it boosted, if your opponent called a trigger unit for that battle, COST[put this unit into your soul], and one of your units gets [Power] +10000 until end of turn. AUTO [R]: When it boosts, COST[S-Blast (1)], and your opponent intercepts as much as possible until end of that battle. 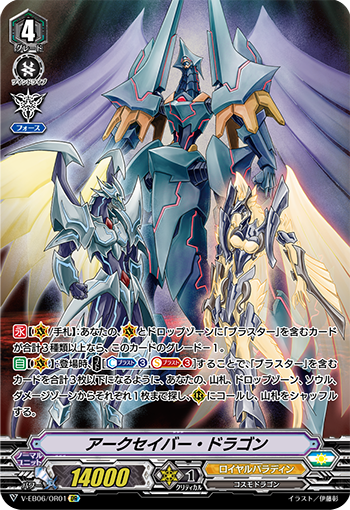 AUTO [R]: At the end of the battle that it boosted a vanguard, if your opponent's vanguard is grade 3 or greater, and they had two or more guardians during that battle, COST[retire this unit], and draw 2 cards.